See the complete line of Evluma lighting products at Booth #407. ConnectLED Windows v2.0 launches with a new intuitive interface, easy-to-manage site licensing through an Admin Portal, plus Dim-to-Off programming. 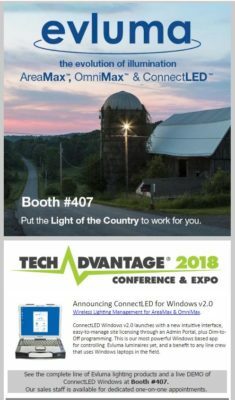 This is our most powerful Windows based app for controlling Evluma luminaires yet, and a benefit to any line crew that uses Windows laptops in the field. Stop by our booth for a live DEMO.